When most people encounter the number 666, their response is trepidatious. People may avoid buying a home with the address of 666 or ask for a change in their phone number if it bears three consecutive sixes. This uncertainty is quite normal when we consider that the Bible says 666 is the number of an antagonistic Beast who scripts the apocalypse. But, there is really a far more meaningful message you can derive from this Angelic Number! Find out more now! There is good news, however. In answering the question of “what does 666 mean,” Greek translations give us one peek. It is the number of humankind (or perhaps metaphysically speaking, the human experience). All life is carbon-based. Carbon consists of 6 each protons, neutrons, and electrons. So, there we have PEOPLE – 666! Angel Number 666 isn’t a stable digit compared to the very grounded 444; it embodies a whirlwind of energy. Seeing 666 means that you are likely incredibly busy and feel pulled in 666 different directions metaphorically. Everything that happens in the next month is important and impacts the overall balance and harmony in your life: It means staying on your toes. Number 666 is the sum of all the numbers on a Roulette Wheel, implying vibrations tied to luck, fortune, and fate. The Chinese agree with this assessment using the number in shop signs. The basic pronunciation of the character for 666 sounds like “flowing” (things moving smoothly). Angels reach out to humans in various ways. One is by using specific numbers, sometimes repeated numbers, to catch your attention. So, what does it mean when you see 666 Angel Number? The first message is one of imbalance. Something isn’t working quite right, and it’s interfering with your best, most authentic self. Fixing this could be as simple as adjusting your work-life symmetry. Take a step back and examine where you focus your energy and whether it’s being used effectively not. When 666 Angel Number appears, in a dream, you are being asked if your thoughts and actions reflect your soul’s contract in this life. You have a mission, and your presence in this world changes reality. To what does the Universe call you? The question is a doozy! Angel Guides tell us that one thing that may give you insight is your body. Is your back bothering you? Spiritually this reflects your supports – are you standing up for what you believe? Perhaps you have had a nagging sore throat for no apparent reason. Are you speaking your truth? Our bodies remember things that we often overlook and express the detrimental patterns as DIS-ease. Your Angel Teachers and guides have come as helpmates. Time to clear out negative thoughtforms and patterns if you are willing. You have free will, but the Angels offer you a gift here where you can make mindful choices for self-actualization. You are a co-creator in your fate so think positively, act honorably, create healthy habits, build impeccable character. Reach out to your Angels. They are ready and waiting for your call. A second focus that Angel Number 666 brings is a focus on your goals and dreams; this is a time in your life to build. You have so much potential, but don’t always believe in that. With the Angels and the Divine (as the saying goes) all things are possible. If you had one thing that would lift your heart and spirit to whole new levels, what would that be? Share that vision with your Angel companions so they can give you tips on achieving just that. Now, this doesn’t always mean you’ll immediately succeed. The process and path here hone your very soul. Be patient and attentive and pay attention to WHY things went a tad awry. Going hand in hand with dreaming is your ability to think and speak differently. Try an experiment. One day when you are not overly busy carries a notebook. Every time you use phrases like “I can’t,” “it’s just that,” “why can’t I be like him/her” or “I am ugly” write it down. Later ask your Angels just what they think of that assessment or mindset; this can be very enlightening. We have no idea how often our views come from a negative space rather than one that’ s filled with hope and faith. Your outer world reflects your inner world. To improve that reality, we have to improve ourselves – the equation is really that simple but certainly very challenging. Angel Number 666 gives you strength. Change your vibrational level: change your life! So, what does 666 mean from a spiritual perspective? The most common interpretation is that you are too wrapped up in material affairs. Somewhere along the way you wandered away from the Path and got lost in the business of daily life. You need a chance to reset, which may require a solitary retreat for serious introspection. Seeing 666 when focused on your connection with the Divine and Universal energies also signal a time of introspection about your fears. There is no question that instability exists; however, things are not as bad as they sem. Don’t jump to conclusions. Focus yourself on those things you can quantify and then research to fill in the blanks. The current discord is temporary, and your Guardians won’t leave until things resolve. 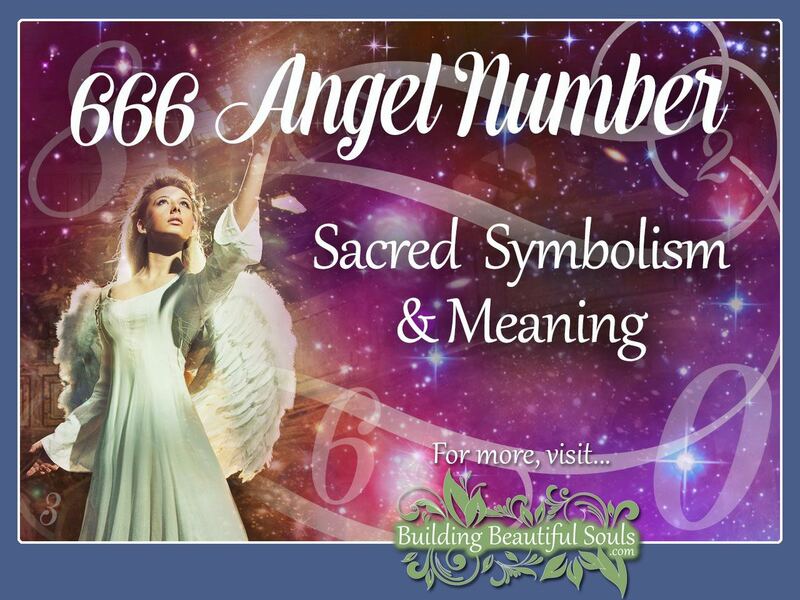 What does Angel Number 666 mean with regards to our relationships and matters of the heart? The word “balance” comes up again from our heavenly messengers. Ask yourself if your relationships are equitable. For any long-term success, giving and receiving have to equal out somewhat. When they don’t, all manner of problems come up ranging from jealousy to anger and bitterness. Sometimes this digit implies a co-dependent situation. Alternatively, if someone you love is unwell, your 666 Love Number portends a time of caregiving. Helping those in need is one of the most virtuous callings any person can receive because of the level of trust involved. It is also one of the most emotionally demanding. In this case, your Angels have come as the first contingent, preparing you for the road ahead. They fully plan to walk it with you. Caregiving is a refining fire for everyone involved, and the Angels want to ensure you have all the Divine love you need to see things through. In physical relationships, seeing repetitious instances of the Angel Number 666 suggests you should get more creative and adventurous with your partner. Things have cooled off, gotten dull and rote. Refreshing your sexual life also breathes fresh air into your entire relationship. Think of this like an emotional tune-up that improves your connections to each other. The interpretation of 666 in Numerology begins with understanding the single digit 6. Pythagoras described six as the first perfect number (i.e., it is equal to all the numbers by which it is divisible – 1+2 +3 = 6). By extension, six symbolizes harmony, peace, the feminine nature, home, and hearth. An alternative way of reviewing 666 in numerology is by reducing it to one digit by math. Three sixes added together make 18. One plus eight is 9. Numerology tells us that nine has associations with kindness, charity, idealism, compassion, and feeling truly loved. In the Book of Revelation 666 is the number of the Beast. This Book is said to foretell the end times, and the Beast is no hero figure! Prophesy depicts the Beast as a very popular person with equally evil intentions. Modern culture uses this imagery in art, movies, literature, etc. typically as an allegory for the Antichrist. There are other mentions of 666 in the Bible. Solomon collected 666 talents of gold annually, and there were 666 descendants of Adonikam who return to Jerusalem after exile. The more often an Angel Number appears, the greater its importance. Think of each encounter like a multiplier. Seeing 666 once may give you pause, but 3, 5 or 10 times and it’s pretty hard to ignore. This entry was posted in Angel Numbers. Bookmark the permalink.